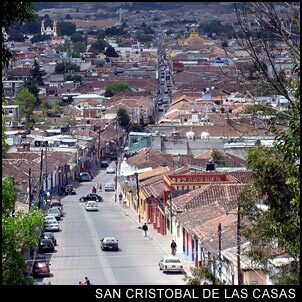 The city of San Cristobal de las Casas rests in the mountains at an elevation of 7,000 feet, or 2,100 meters. This makes San Cristobal a great summer destination with its cooler temperatures . . . and in the winter, San Cristobal is one of the few places in Mexico that actually require a jacket. If you are planning a visit by land, you will find that all roads leading to San Cristobal are poorly maintained rand full of hair-pin turns. So forget what you see on the map or distances listed in your travel book. Plan on 5 hours to get to palenque or all day to get to Oaxaca. So, what is it that makes San Cristobal de las Casas a destination to be mentioned here or in your tourist book? San Cristobal de las Casas is on the Mayan trail that is mostly frequented by backpackers and those with plenty of time to explore Mexico. Other than that, it is the Indian heart of Chiapas, the locals are very friendly, the beautiful mountain scenery is unique, and it is a nice place to be when it is too hot elsewhere in Mexico. San Cristobal is a nice city with plenty of its own flavor . . . and there are things to see listed in the San Cristobal attractions page . . . but San Cristobal is a city for those who want to drop off the face of the earth for a while . . . not for those looking for tons to see and do.